The Right Brain: Inspected and Special Inspected! 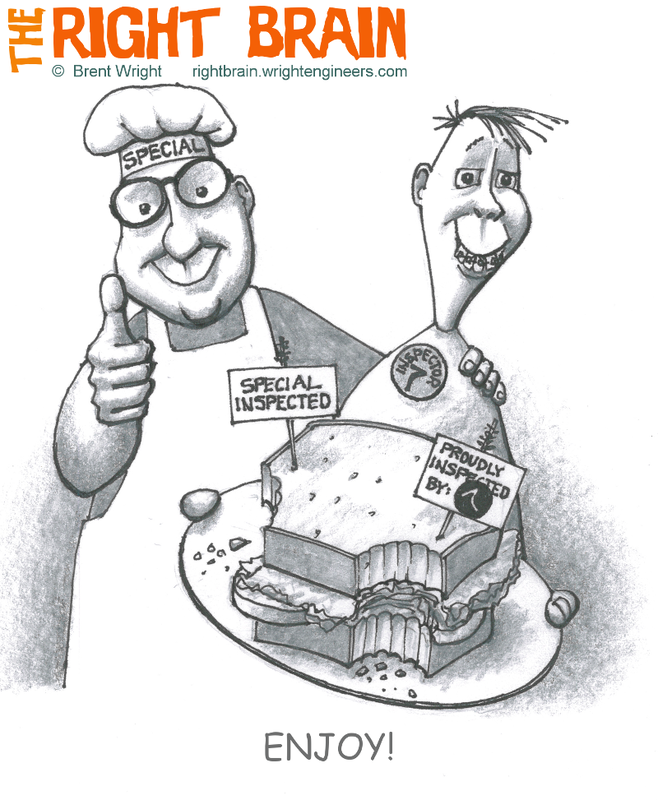 Last month's cartoon showed a high schooler sandwich inspector proudly serving up a BLT. This time it seemed like a good idea to add a special inspector. After all, if one inspection is good, two's gotta be twice as good, right? Especially if it's a designer gourmet sandwich - no way you can trust the plain old inspector to make sure it's whole grain bread and real mayo. As a structural engineer, I certainly appreciate the need for special inspection on critical elements of a project (and since we offer special inspection services, I'm very glad it's required) - but I can't help feeling a bit bad for the plain old inspector. Do we not trust him? The way things are going, one day the poor guy'll be out of a job unless he becomes more... well, special. And if you think it's bad for the plain old inspector, consider the poor mason. Unless his masonry work is inspected by BOTH the plain old inspector AND a special inspector, his work is trusted to be only HALF as strong as it could be. Talk about a lack of confidence in your work. It's a wonder they all don't have a complex. For all the abuse the inspector gets, though, he can hold his head high knowing that in a very real way he's helping to make his community a better and safer place. All you have to do is read about the horrific death toll due to collapsed buildings after almost every earthquake in a third-world country to appreciate the quality construction the inspector is enforcing. He or she deserves a hug. For more cartoons having fun at the expense of our inspector friends, click here.